Detlef Schmicker has posted to maemo-developers the first results of his hack to use VNCViewer to connect to a locally running Debian instance on the tablet to solve the keyboard/input issues. 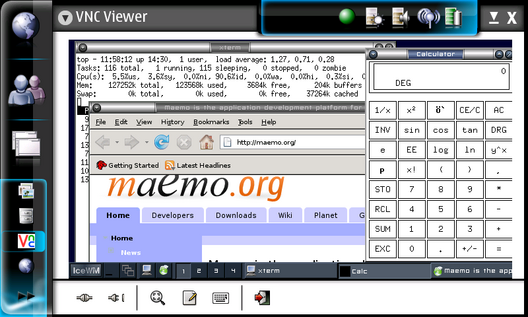 He's had Firefox, Gimp and Xterm all running on his N800 in the IceWM window manager, with VNCviewer providing the keyboard. No network connection was necessary. It's a very cool hack, it'll be interesting to see if it can be packaged for end-user use. The Internet is everywhere.... or will be. One day. Maybe. [...] an app or service (it doesn’t have to be inside the device, it could be on the network) that demands online, constant access." "You don't need a PIM, as you use an online calendar." "You don't need a good email client, use Gmail or similar." "You don't need $X, use $Y online." Now it's self-evident that we're not in a world of ubiquitous Internet yet. Norwich city centre's free wifi rollout could be considered a start, as could the talk of a non-free nationwide WiMax network. ...which is cheap (or even free) at home and not exhorbitantly expensive when on holiday abroad. ...on the train - in a railway cutting or tunnel (both very common on the UK's West Coast Main Line) with no line of site to a base station or satellite. ...on a plane - despite existing carriers cancelling the service due to cost. ...in the Channel Tunnel - when popping over to a foreign country, incurring roaming charges etc., even when I'm still closer to Great Britain than when in Northern Ireland. ...on a boat in the middle of the English Channel. Personally, I doubt the Internet will ever be ubiquitous in these locations without paying a fortune (after all, if an FM radio signal can't be ubiquitous, why would people pay to make a cheap Internet connection available); and why should I have to pay a fortune to check my calendar? Yes, these are Internet tablets, but I should be able to carry my bits of the Internet around with me. It's in the certified tableteer repository, but it can be installed straight from the deb: fmradio_1.2.0_armel.deb. Once installed, you have to start fmradio direct from an XTerm, or enable the new "FM Radio" home applet. Headphones are required to act as an aerial, but you can choose to output to the built-in-speakers or the headphones with toolbar buttons.